Ladders: Trivia, Superstition, History and Cave Paintings! Sometimes I get a little apprehensive just before I start writing a script for a new eLearning course – there’s something scary about putting a deadline on a creative project. What if the ideas don’t flow? What if writers-block sets in? What if I’m given a ‘mundane’ subject and the inspiration jar is as empty as our office biscuit tin?! That last question hit me when I found out that no one was planning on buying any more biscuits my new script was ‘Ladder Safety’. As writers, our brief is to create a script that’s informative, engaging and easy to follow – so I was stuck! How do I muster enthusiasm for this one? And how on earth do I write a script that’s not only concise and compliant with legislation, but one that’s ENGAGING too? It’s believed that humans have been using ladders for over 10,000 years! 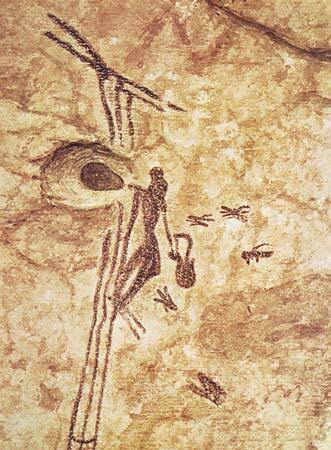 There’s a cave painting from the Mesolithic period (Middle Stone Age) in the Spider Caves in Valencia, Spain, that shows two people using a thin grass-like ladder to collect honey from a bees nest. And in medieval times, a process called ‘escalading’ was used, meaning soldiers would use wooden ladders to scale an enemy’s castle walls! I also stumbled across the origin of the board game Snakes and Ladders. It was created in ancient India and it’s believed that ‘Moksha Patamu’ or ‘Mokshapat’ (as it was originally called), has been played since 2nd Century BC. The first comes from the early days of Christianity and the number 3. This number is considered sacred because it represents the Holy Trinity (Holy Father, Holy Son and Holy Ghost/Spirit), which makes the triangle a sacred symbol. When a ladder leans against a wall, the lines connecting the ladder, the ground and the wall create a triangle. To walk through this triangle (i.e. to walk under the ladder) was a symbol of the Holy Trinity being broken. And as breaking the Holy Trinity was considered blasphemous and an unforgivable sin (it was often a basis for hangings and witch burnings/drownings) the fear and superstition emerged. Then there’s Ancient Egypt – a ladder was placed inside the tombs of the deceased so their soul could make its way up the ladder and into the afterlife. To walk under the ladder was to invade the sacred space, which prevented the deceased’s soul from making its onward journey. Some believed this brought a seven-year curse to the unlucky person. And then there’s those who were too scared to walk under a ladder back when the gallows were used in medieval times - because people had to climb a ladder in order to be tied for hanging. Anything connected to the gallows had everyone petrified. Some believed that once a person had been hung, their spirit haunted the triangle that was formed by the ladder - so to walk under a ladder was considered a death sentence! Re-tracing their steps and reversing back under the ladder. Or they can spit on the ladder rungs or their own shoe (eww), BUT they can’t look at their shoe until the spit has dried! PLEASE NOTE – hazards are created when you don’t look at where you’re walking! For proof, take a look at our Slips, Trips & Falls course. However, since neither of these options comply with health and safety best practice, I suggest you try my favourite solution if you find yourself in this position - cross your fingers and keep them crossed until you come across a dog! Although it goes without saying that you should never EVER walk under a ladder anyway (superstitions aside) because the risks to your safety are simply not worth taking. Ladders are an impressively simple, modest and practical piece of equipment that make many tasks much easier and safer to carry out, but ONLY IF they’re used correctly. Having the necessary skills and knowledge to use ladders is vital in reducing the risks to your own safety, and the safety of those around you. Our short and sweet Ladder Safety training course will be ready very soon; and it’ll provide you with all the tools you need to competently and confidently select, check, setup and use ladders. Take a look at our Ladder Safety Training for more information. If you get a ladder in your tights, apply clear nail varnish around the torn area or spray it with hairspray; either should prevent the ladder from growing until you can get home to change!